There have been many castles, forts, palaces, fortified manours, towers, and fortified churches and monasteries built in Britain. In England, Scotland, Wales and Northern Ireland. There are clearly too many to name here. Castles are either built for fighting, or domestic living; but the French distiguish these functions as either a family château, or a military château-fort: similarly in Germany there is a military burg, and a family schloss. Mediaeval castles as we know them emerged in France under the Carolignians in the ninth century after Roman security had dissappeared. Europe was faced with a series of violent attacks by Arabs, Vikings and Magyars from the eighth through the eleventh centuries, which made security an urgent concern for those who could afford it. A castle (from the Latin castellum for fortress, and castrum for fortified place), means a small fortified place, and it was often a private, fortified residence of a feudal noble, or monarch. As Rome fell and government security disappeared, wealthy men built castles for their family's protection. A castle was built to house the owner's entire extended family, their servants and animals. The castle walls protected a complete community with everything required for normal life either inside, or just outside in the surrounding fields, forests and countryside. The idea comes from the walled cities of ancient Rome and the fortified palaces of Byzantium. The Romans took the concept from even earlier Middle Eastern cultures. Castles were built as symbols of power all over western Europe during the upheavals and wars of the Middle Ages. However, castle structure probably originated in the Middle East in Byzantium and Egypt. Mycenean Greek kings had lived in fortified stone palaces, but walled cities may have started with Jericho, c8000 BC. Military architecture has of ten been a defensive response to insecure times and mediaeval castles were built to withstand siege and protect land, and sometimes embraced whole towns like; Ávila in Spain, Carcassonne in France, Chester in England, and Visby in Sweden. The very practical Normans filled a special role in this development, since they built more than 500 castles in Britain before c1100. Ancient Britons had fortified hilltops with massive earthworks in a series of ditches and 2m earth walls, such as the Maiden Castle in Dorset, for tribal defence. The orginal neolithic construction has been dated to c4000 BC, although the current remains were built in c300-600 BC. The earth walls apparently housed a population of up to 1,000 at various times. The Roman General Vespasian probably captured the Maiden site in 43 AD. The Romans built a temple on the site in c395 AD. Evidently the name Maiden derived from the early Brythonic Celtic mai dun, to mean great hill. The label 'castle' is misleading as there has never been a castle structure at the site. Hundreds of similar ear-walled forts were built around the world. Those in Europe usually built prior to imperial Roman expansion. The Romans built military encampments and an impressive chain of fortresses to guard England from Saxon raiders in the second and third centuries AD. The Anglo-Saxons and the Danes entrenched their towns behind earthen banks and timber palisades to create fortified towns called burhs. From burhs we have derived the modern word 'borough'. A castle could advertise a military base, a seat of government, a court, and a stronghold for the surrounding region; but it was principally the private residence of its owner, his family and his dependants. In the eighth and ninth centuries lawlessness led noblemen to build motte and bailey castles of wood, earth and stone, carefully sited for strategic defence. Recognising the tactical value of high ground the castle, or main house, was built on a hill with a local village below the hill. The main house and yhe supporting village houses and barns were all protected by a ditch and bank. 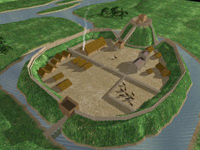 Saxon castles were small, square, often simple wooden structures on top of a mound, surrounded by a ditch. If a noble's domains were flat, he might have constructed an artificial mound, called a motte. As mediaeval siege craft developed, a wall or series of walls or palisades was raised around. Some distance from the motte; but still within the walls was an open courtyard area, which became known as the bailey. A variety of buildings might also be found in the bailey such as the main castle hall, chapel, wells, stables, animal pens, gardens, blacksmiths, kitchens, barns, soldiers' barracks, etc. By the eleventh century the motte and bailey castle structure was widely prevalent in Britain, Ireland, and France. On landing in 1066, William was reported as building a motte-and-bailey castle shore defence at Pevensey in just eight days! After 1066, Norman architecture became prevalent in the Britain. As Mediaeval governments were incapable of guaranteeing peace and security, home bases required defence and the castle was the best choice. The Anglo-Saxon Chronicle states that in 1067, while William was in Normandy, his deputies, his step-brother, Bishop Odo of Bayeux and his friend Earl William FitzOsborn built castles throughout England and oppressed the poor people. The Chronicle remarks on the castle construction by the Norman leaders, because custom limited the extent and strength of private fortifications. Well fortified nobles might decide to confront the king as a threat, as had been the case in Saxon England. The king authorised castles and in a survey of 1150 there were 1,115 unlicensed castles in Britain. They had either to be quickly justified to the king's men, or the castles would be forfeited to the crown. Motte and bailey castles were quick and cheap. Within the stockade of the mound, was a timber tower. Tower and motte formed the strong point of the castle; the last defence if attackers overran the bailey. The tower was the home of the castle's owner and had to be large enough to contain his family and their servants. Within the bailey were the wood buildings necessary for the running of the castle; and the hall where everyone in the castle usually gathered for meals and other social events, the kitchens, barns, workshops, stables and the chapel. The entrance to the bailey was by means of a strongly defended gate, fronting a bridge over the ditch. Yet, in spite of its primitiveness, such a castle would have presented a formidable obstacle to attackers equipped with the available weapons. Mottes ranged from 7-25m in height, with the timber tower giving the defenders a further advantage. The bailey (courtyard) of from one to three acres, was laid out within bowshot range from the tower. The Normans were prodigious builders. Not only did they erect massive stone castles in England but they replaced most of the Saxon churches in equally impressive stone. The Normans built monumental castles and churches with enormous arches and huge columns. Norman builders contributed the 'keep' to castle building from as early as the late tenth century and were always built on the strategic ground. The term 'keep' apparently came into use in the sixteenth century to replace the older French term 'dongeon' - now anglicised into dungeon. TE Lawrence identified European construction by the presence of a keep amongst the 40 Crusader castles, which he visited in the Middle East. In the ninth century the Viking, Moorish, and Magyar invasions demonstrated the need for stronger defences and better architectural design. The resulting tenth and eleventh century castle improvements were built in stone and moved the principal family into strong stone towers. Wooden outer walls were also replaced by increasingly sophisticated stone walls. The main towers were called donjons by the French and were later called keeps by the English; but they were really strong, central fortresses. The tower was the castle's final defensive refuge, and might also provide secure a dungeon for captives. William the Conqueror built the White Tower at London as a defensive donjon. Guillaume de Corbeil built the castle at Rochester in 1127, which featured a strong donjon. The walls for these stone towers and walls were thick: the main entry at Acre has walls 50m thick (although it thins to one metre) and 10-13m high. Castle defensive walls were often 3-4m thick to defeat direct assault by rams or stone missiles. By their very strength stone castles succeeded in defeating all but the most determined attacks. Attackers soon learned the danger of attacking wallwd castles and strong towers without adjusting their tactics. Fire was used to burn roofs and destroy reserves, and tunneling to weaken walls and create gaps, soon became routine. The Norman donjon had private apartments, a well for water, and everything to sustain the castle inhabitants through a long siege. Keeps were the last refuge with walls up to 7m thick protecting most of the household who ate and slept together. The first Norman keeps were rectangular, but Crusaders learned that a round keep was easier to defend with fewer blank areas uncovered by the defenders. William Marshal built the round Pembroke keep in 1200 for his moated, castle in Wales. In the thirteenth century the castle became more sophisticated as living and administrative quarters were moved from the keep into new buildings in the bailey. The smaller and stronger keep, became the final defensive position in a series of battlements. Typically, there was only one entrance to the keep, usually at second floor level. This was reached by an external staircase running up against the outer wall and covered by a fore-building. Windows were small and restricted to the upper levels. Due to their great size and weight, the tower keeps could not be built on the motte and most were, erected on flat land either within the bailey or straddling its outer defences. Concentric curtain city wall and enceint wall with large cylindrical bastions and narrow windows, or arrow loops, to cover otherwise unseen dead ground. The ditch and primary castle-entry barbican, projects is covered by the bastions. Carcassonne has been occupied since at least c3500 BC and the Romans fortified the hilltop around 100 BC. Eventually it became known as Julia Carsaco. The city has had a turbulent past. The Visigothic king Theodoric II had held Carcassonne from 453 and added fortifications, traces of which still stand. Theodoric is thought to have begun a basilica now dedicated to Saint Nazaire. In 508, the Visigoths defended against Clovis I, the King of the Franks. Moors from Barcelona captured Carcassonne in 725. 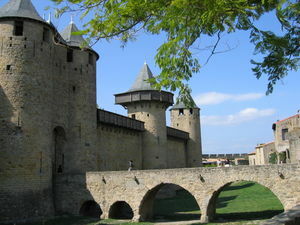 Carcassonne became famous for its role in the Albigensian Crusades, when the city was a stronghold of occitan cathars. In August 1209, the crusading army of Simon de Montfort forced its citizens to surrender. After capturing Raymond-Roger de Trencavel and imprisoning and allowing him to die, Montfort made himself the new viscount. He added to the fortifications. Carcassonne became a border citadel between France and the kingdom of Aragon. The Normans replaced many of their own and Saxon wooden castles with thick stone outer walls, finally topped with wide battlemented parapets. Feudalism was based on land and its defence against all meant more defences. The next step in Norman castle development was the addition of a towering masonry keep, in the bailey. The keep, up to 30m high, had thick walls (often one-third the height) and small windows. (The White Tower in the Tower of London is William's Norman keep.) Wide, deep moats replaced crude ditches; ideally filled with water but often dry they were crossed by drawbridges, raised from the castle. At the castle end of the drawbridge was a wall opening, containing a portcullis, a thick, iron-plated wooden door that could be raised. The Chateau de Bouillon castle is built on a high rocky spine in the elbow of a river and direct access is protected by three drawbridges. You can see that the drawbridge shown fits into the gated space to add the bulk of the raised drawbridge against the attackers. The defenders had height as well as the protection of a river-moat and high stone walls. It was never attacked successfully and ended life as an Austrian fortress and later armoury. Necessarily a drawbridge implies a moat, either wet or dry, to create an obstacle to limit entry. 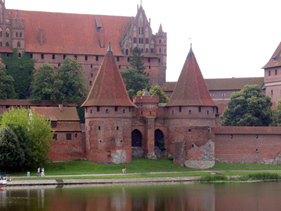 Construction on the Marienburg castle in Poland was begun in 1275. The pictures show both some of its enormous size and the square donjon. This was the seat of the Grand Masters of the Teutonic Order of St John. In 1902, Kaiser Wilhelm stated that "...ancient Marianburg was the starting point of the civilisation of the countries east of the Vistula." It was Konrad, Duke of Masovia who invited the Knights of St John into Poland to control the Prussian tribes. Konrad expanded his invitation to include German settlers, so many of the Polish castles, like Malbork at Marienburg, are in fact German. No corners for attackers to shelter in. No 'dead ground' unabled to be covered by the defenders arrows. Easier dome construction for roofing. Less need and use of expensive materials. Arab castles in Spain, built after the 711 invasion by Tarik and his 12,000-man army, were called 'alcazabas' and were meant for war. (The Arab 'alcazar' was a family castle, or palace). Typically Arab castle-walls were strengthened by angular towers and the walls were often made of cement and stones poured between wooden forms, As seen at Carmona, the walls were usually crenellated with pointed 'merlons'. Typically, Arab walls were significantly thinner than European castle walls. The heavy gates like that shown at Carmona were usually approached over a wooden drawbridge, which could be raised to fit inside the gate opening. The Hollywood castle drawbridges did not come into use until the fourteenth century, because most French castles were not moated until the late fifteenth century; however, many French chateaux have two drawbridges - one for pedestrians and one for horses. 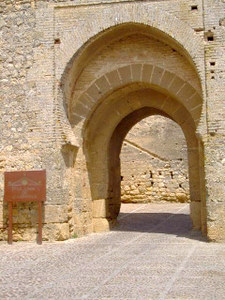 The Moorish Gate at Carmona, near Seville. Built on a Roman fortress, sited on a hill with winds and views. In the opposite picture you can see the gate fitted into the wall when closed to seal the wall. The Hospitallers Reynald de Châtillon used Château Kerak in Jordan as his base 1183-1186 to provoke a poorly led, Christian war with Saladin. Castles were built in most societies as the best defence against steel weapons. The castles' era ended with the introduction of gunpowder and mobile siege artillery. Turkish and Arab armies were less reliant on castles, since the call to expel the Christians was widely supported by nearby populations. Ajloun is Arab, built in 1185 in Jordan protect against Crusader attacks from Karak and Bisan, and dominated the Jordan Valley. The construction is similar to Crusader castles with a squared tower. 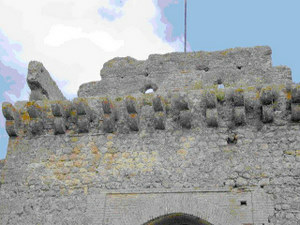 The castle was enlarged in 1215 by the Mamluks. 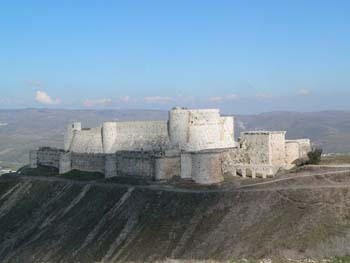 In 1260, Mongols destroyed the castle, but were defeated by the Egyptian Mamluks at Ain Jalut, and the Mamluk Sultan Baibars restored the castle. 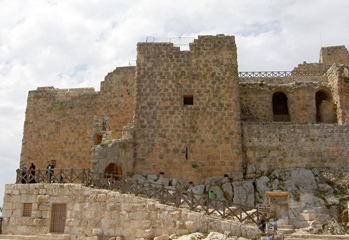 Krak des Chevaliers is in Syria, north of Lebanon and was built 1150-1250 to house 2,000 Hospitallers. It has concentric walls enabling fire from the higher inner walls as well as the outer curtain. The Sultan Baibars captured this fort in 1271 and rebuilt the wall adding the square tower on the right. 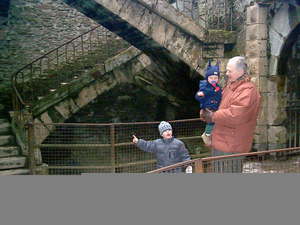 The bridge on the right carries water into an open cistern between the walls. King Edward I, of England abandoned the 'passive' keep in favour of an active gatehouse. The initial baron's housing was built into this new structure and presumably motivated the baron to ensure his family's defence. Later castles maintained the gatehouse garrison location and moved the lord and his family further inside the walls. This style is particularly seen in Austrian castles, which typically have an enceinte, or curtain protective wall, a gatehouse, a 'zwinger', or confined open space between the outer wall and the inner buildings, a covered wall-walk, a kitchen, a great hall, and the keep. 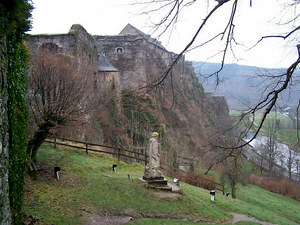 A castle was often built on the edge of an impregnable cliff, ideally at a bend in the river where it could command a view of the surrounding countryside. The Château Gaillard, built by King Richard I, of England, in Les Andelys, France and Marienburg Castle, Poland, headquarters of the Teutonic Knights, are examples of strategically located castles. From the earliest date, stone walls appear to have been crenellated crenel meaning an opening or embrasure; that is they had battlements. These alternated embrasures along a wall with solid upright merlons. Battlements were also added to the walls of keeps, whether a shell or tower. Most French fortresses were built with machicolations (corbelled crenellations), which often supported protected walkways - the typical example being at Angers in France. The walls frequently contained small rooms, such as bedchambers, latrines, guardrooms and even small kitchens. The corner turrets contained spiral staircases providing access to the various floors and on to the roof and battlements. Towers built at intervals along and projecting beyond the outer face of the wall enabled the defenders to enfilade the wall while remaining under cover behind the battlements of the flanking tower. The use of gunpowder in projectiles brought to an end the impregnability of the mediaeval castle. Edward the Confessor sometimes held his court at Windsor (there was no castle) and the former manor at Old Windsor was a residence of the Saxon kings before the Norman Conquest. Edward created Sir Other FitzOthoere Baron of Windsor and then the Norman William built a new stone castle at the present site c1070 and then used Windsor as a residence to try to legitimise his reign. The main castle dates from Henry II and was rebuilt c1344. Edward III used Windsor as a gathering place for his knights of the Garter; and their insignia line the walls of St. George's Chapel. Investitures of Garter knights are still held in St. George's Hall. The dominant castle structure is the Round Tower, or keep, 24.5 m (80 ft) high, on the site. The keep was used as a prison until 1660 and is still surrounded by a moat. Curiously, Japanese castle construction was quite similar to European, no doubt for the same reasons of materials and technology. 1 See "Castles" and "Architecture," Microsoft® Encarta® Encyclopedia 99. © 1993-1998 Microsoft Corporation. See also http://www.btinternet.com/~timeref/castmott.htm, Wikipedia, 'Motte-and-bailey', http://en.wikipedia.org/wiki/Motte-and-bailey, Castles of Britain, http://www.castles-of-britain.com/castle6.htm, and Castle at, http://en.wikipedia.org/wiki/Castle. For overviews of national architectures and designs see Castle Photo Gallery at, http://www.castles-of-britain.com/castlexc.htm; The Gatehouse, The Lists of Mediaeval Fortified Sites of England and Wales at, http://www.ecastles.co.uk/philipdavis/lists.html; List of castles in Scotland at, http://en.wikipedia.org/wiki/Scottish_castle; List of castles in France at, http://en.wikipedia.org/wiki/List_of_castles_in_France. 2 Marcus Binney, Chateaux of the Loire, Architectural Guides for Travellers, pp.6-7. See also Christopher Gravett, Castle. 3 Douglas Simpson, Castles in Britain, p. 22. 4 TE Lawrence, Crusader Castles, sets out the differences between Latin (French) and Greek and then compares each castle to basic style patterns. He noted also Roman, Turk and Arab constructions. 5 Lawrence, op cit, p.103. 6 The original tower, known as the White Tower or Keep, is flanked by four turrets and enclosed by two lines of fortifications. William the Conqueror ordered the original tower built and work was begun in 1078. It was designed by Gundulf, bishop of Rochester, and completed in 1097. 7 In fact the Knights were officially known in English as 'the House of Hospitalers of Saint Mary of The Teutons in Jerusalem - the Teutonic Order'. 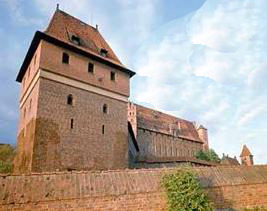 See http://www.castlesofpoland.com/prusy/index_en.html. See http://query.nytimes.com/mem/archive-free/pdf?_r=1&res=9A03E4DB1330E733A25755C0A9609C946397D6CF&oref=slogin. See also http://www.castlesofpoland.com/prusy/historia_en.htm. 8 Alberto Weissmuller, Castles From the Heart of Spain, p. 29. See also The Crusades, at http://www.nabataea.net/crusadesintro.html. 9 Binney, op. cit., p.6. 10 Felix Helmer, Castles in Austria, p. 3. Helmer goes on to define Austrian castles as 'burgs'; fortresses as 'festungs'; and palace as 'schloss'. He further notes that most construction was angular, with only a few cylindrical towers. 11 See Sheila Sancha, The Castle Story, for an excellent castle development outline. She defines most terms pp. 216-222. 12 Binney, op. cit., pp. 7-8. 13 Sir Richard Rivington Holmes, Windsor, p.3. 14 "Windsor Castle" Microsoft® Encarta® Encyclopedia 99. © 1993-1998 Microsoft Corporation. 15 Kiyoshi Hirai, Feudal Architecture of Japan.